After reading this book, I plan to experiment with the obscure feature method and the generic parts method. They might be great ways to sharpen my observational skills and see opportunities for everyday creativity. You can click on the image below for a larger version. 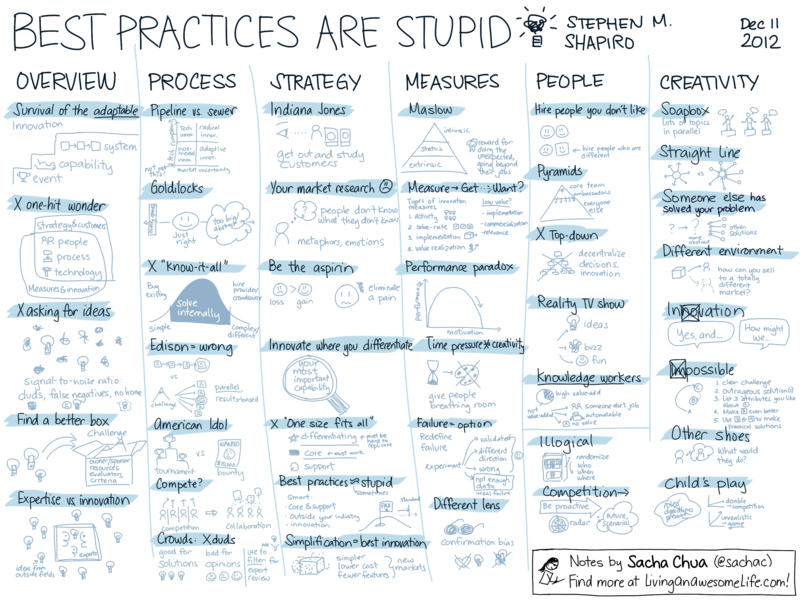 Here’s my visual summary of Stephen M. Shapiro’s 2011 book Best Practices Are Stupid: 40 Ways to Out-Innovate the Competition (affiliate link). It’s a good book for people handling innovation management in medium and large enterprises, although small business owners might still be able to apply a few tips like the one about getting out and observing your customers (Lessons from Indiana Jones, p.69) and when to buy/innovate/hire solutions (There’s no such thing as a “know-it-all”, p.42). 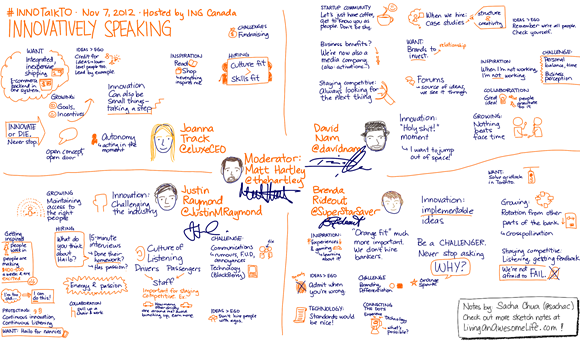 Click on the image to view a larger version, and feel free to share it under the Creative Commons Attribution Licence! Click on the image for a larger version! Please feel free to share this under the Creative Commons Attribution Licence. The panel was moderated by Matt Hartley. 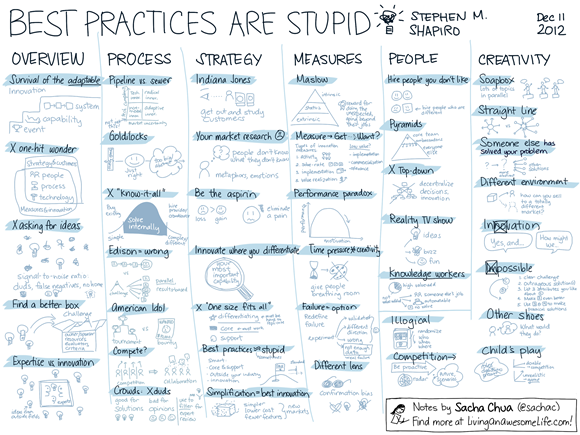 If you like this, check out my other sketchnotes! 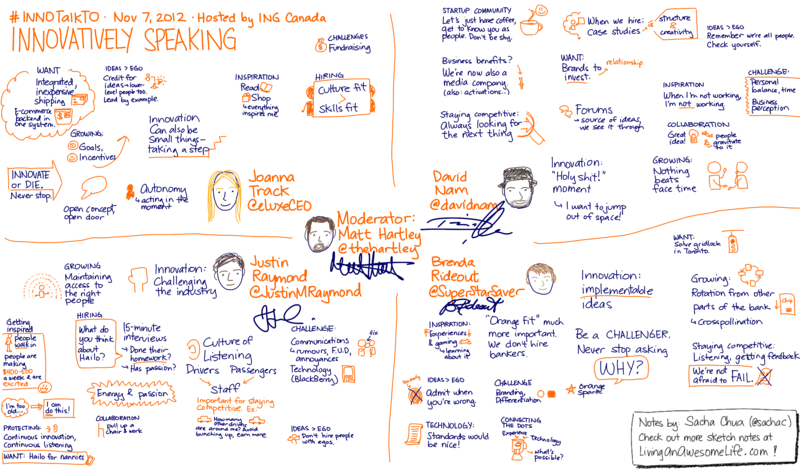 ING Direct invited me to this event. Whether social networks were built using traditional means or by using new social technologies, these networks can make a difference in the success of a project. Without ways to tap into the broader social networks in the company, innovators may find themselves working on a project alone, or with a few people who have similar interests and skills. With a wide, diverse network such as the ones facilitated by corporate social networking platforms, innovators can reach out, find people with similar passions and complementary skills, and help make things happen. Innovators can discover similar initiatives in the early stages of development, reducing duplicated effort and allowing people to accomplish more.